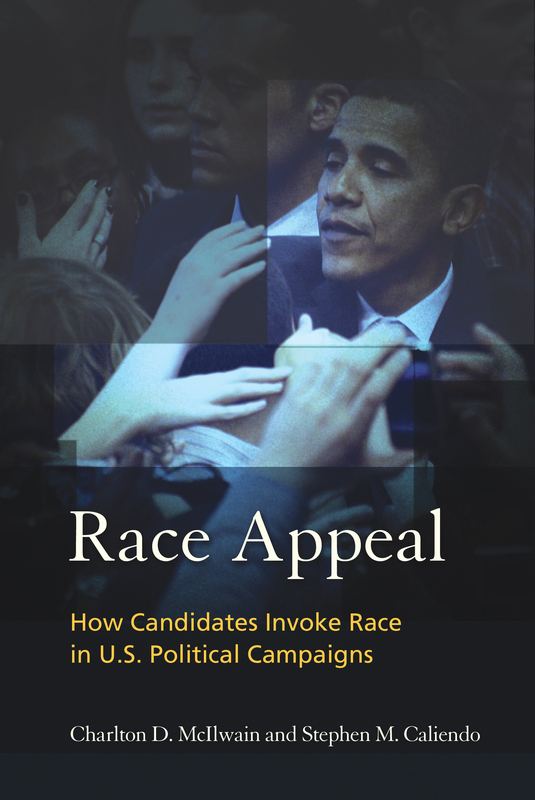 Stephen M. Caliendo, who co-authored Race Appeal : How Candidates Invoke Race in U.S. Political Campaigns with Charlton McIlwain, discusses the process of how he and his co-author became involved in The Race Project. It would only be a slight overstatement to say that my life changed when I met Charlton McIlwain in 2000. My world wasn’t shaken in the way that it was when I met my wife or witnessed the birth of my children, but my professional life over the past decade would certainly have been different had we not both been at Princeton University teaching with the Junior State of America the summer before America’s innocence was lost (again). We actually didn’t decide to launch The Project on Race in Political Communication that summer. That would happen the following year. But we began conversations about our scholarly interests and our perspective on the state of knowledge in political communication with respect to issues of race. To that point, some excellent work had been done, and some of the biggest names in the field were interested in questions about race-based communication. But to the best of our knowledge, there was no sustained, focused effort to study race in the context of political communication. A combination of naïveté and arrogance must have led us – two untenured junior faculty members – to create the Race Project. “Project?” It was just the two of us, with limited funding from our institutions. Who did we think we were? But we had a vision, a semblance of a plan, good training, and a website. We were off. Ten years later, we offer Race Appeal, which is the culmination of the first decade of our work together. Our findings aren’t always intuitive, and while they confirm existing scholarship in many ways, they also point to possible trends that will require closer study in the coming years. Charlton and I will be involved in that work, but so will others. Had we not met that summer, though, perhaps neither of us would be. I spent my childhood raised by Baby Boomer parents who instilled in me a ferocious sense of justice with respect to how I viewed others. There wasn’t a lot of fancy talk about institutional racism, hegemony or patriarchy (let alone heterosexism), but I knew that prejudice was wrong, and I was shielded from overt bigotry. During my years as a member of the Young Republicans of Pennsylvania (I held statewide office during my undergraduate years), where the culture was one of acceptance but a steadfast ignoring of systemic factors that contribute to racial injustice, I had not had my racial consciousness raised. But during those years, I was also listening to Public Enemy and KRS ONE, and I started to have dissonance about the America that I believed gave everyone a fair shot at success. When I heard Chuck D say “I’ve got so much trouble on my mind,” I paid attention. What was I missing? Does race (still) matter (I didn’t experience Cornel West until I got to graduate school)? If it does, how so? And why isn’t it obvious to everyone? I didn’t study critical race theory in my doctoral program, and while my interest in race-related issues remained high (the O.J. Simpson murder trial took place during that time), my scholarship was elsewhere. But that changed when Charlton and I met. His training and expertise in culture and communication and mine in political science combined in such a way that we saw an opportunity to help advance understanding of those issues. I am proud of Race Appeal because it offers a complicated, nuanced set of answers to these types of questions. We found that race-based messages are used by candidates of all races. We learned that potential voters – both Black and White – are likely to punish a candidate whom they perceive is “playing the race card” (irrespective of whether there was intent to do so). We saw less racial framing from media sources than we expected. And we found implicit race-based message alive and well in many recent contests (that is, it didn’t all end with Willie Horton). We didn’t try to be “neutral”; we simply let the data guide our story. Activists won’t herald this book as a manifesto, and social conservatives won’t berate it. That’s not to say that our work is value neutral. As is evidenced by our public appearances and the material that we feature on our Facebook page and Twitter feed, we have a deep dedication to promoting racial justice and increased awareness of the power of systemic racism. We are driven to understand the myriad ways that Americans can be affected by race-based messages, and, as we look forward to at least another decade doing so, we hope that Race Appeal inspires a new generation of scholars to fill in the many gaps that deserve attention and join us, as well as our predecessors and contemporaries, in putting together this extensive puzzle that comprises the intersection of race, politics, communication and psychology. Q: What prompted you to write your autobiography? A: People are always spellbound when I tell stories of my animal work, of the abuses I find and how I try to fix them; of my interactions with cowboys; of the crazy reactions some of my work garners from putatively sane people. I have been asked repeatedly to put my stories and life history into a book, and finally did so. Q: You state that your passion is a “moral concern for animals.” How/when did you develop this—and what challenges did you face to commit to it to the extent you did? A: I was shocked when as a child I visited a shelter full of wonderful, beautiful animals, any and all of whom I would have been happy to take home had I been allowed to do so. When I asked what happens to them, I was told that they would be “put to sleep.” Also, as a child growing up without a father I felt extremely vulnerable and unprotected. It dawned on me that animals shared that situation. As I grew up to be physically and intellectually strong, I felt obliged to help protect them. Q: You have done much to improve the situation for animals. You improved the condition of laboratory animals, and put an end to such practices as over-operating on animals in veterinary and medical schools. Did these related efforts develop naturally, or from your growing reputation? A: I was fortunate to be faced with real ethical issues in animal use at the same time as I was attempting to develop a new ethic for animals. These two tasks operated synergistically, so that convincing the veterinary school to lessen the severity of animal use led me to seek realistic and practicable solutions that could be sold to educators. Similarly, the more I learned about biomedical research, the more I worked to create a practicable ethic for animals that researchers would adopt, despite their ideological denial of the relevance of ethics to science. There being very few people working on real solutions to ethical issues occasioned by animal use in science, my work attracted considerable interest and attention. Q: Much of your life has been dedicated to passing laws that protect animals used in research. Can you describe the reputation you developed when you want humans to use pain-killers when operating on research animals? A: Somewhat to my surprise, I was not welcomed and embraced by either the research community or the activist community. In one banner week in 1982, I was labeled a “Nazi and an apologist for lab-trashers” by the New England Journal of Medicine and a “sellout for accepting the reality of science” by an activist magazine. Initially quite depressed at these demented responses, I was assured by friends and colleagues that I must be doing the right thing if I was getting attacked from both sides. Q: You write about connecting with animals first through having pets. You discuss farmers who talk about caring for sick animals, often spending more on them than the animals may be worth. The dedication animal owners have is often unshakable. What have you observed in your travels about the bond between humans and animals? A: I have seen old and lonely people redeemed in their lives by their relationship with animals. I recall one old lady in Manhattan bundled up in heavy clothing to take her little dog to the park. I remonstrated with her that the city was in the grip of a major storm that could put her in danger of accident or illness. She replied that “I must take Fluffy to the park. She misses her friends.” For this lonely woman, her obligation to her dog provided her with a reason to get up in the morning and brave a snowstorm, thereby rescuing her from a sedentary existence. Q: You were booed by cattleman at a lecture for one minute and 40 seconds before you said anything. You also write eloquently about your classroom experiences—getting rodeo cowboys to use breakaway ropes. You often disarm the folks you educate by getting them to think about their processes and actions. How did you develop your strategy/approach for changing minds? A: In teaching history of philosophy, I inevitably taught Plato. I recalled Plato’s dictum that one could not, when dealing with adults and ethics, teach, only remind. I took this to mean that one could not try to force one’s ethics on others, but rather show them that your ethical conclusions in fact follow from what they already believe. I used this approach very effectively with individuals, and also with anticipating the direction the social ethic to go regarding animals. Q: You are a philosopher, but also a professor, an advocate of biomedicine and veterinary ethics. How did you intertwine these related/diverse subjects? A:It was not difficult to do this. I taught history of philosophy for many years for seven hours a week. No one asked the question of why animals were excluded from the scope of moral concern. 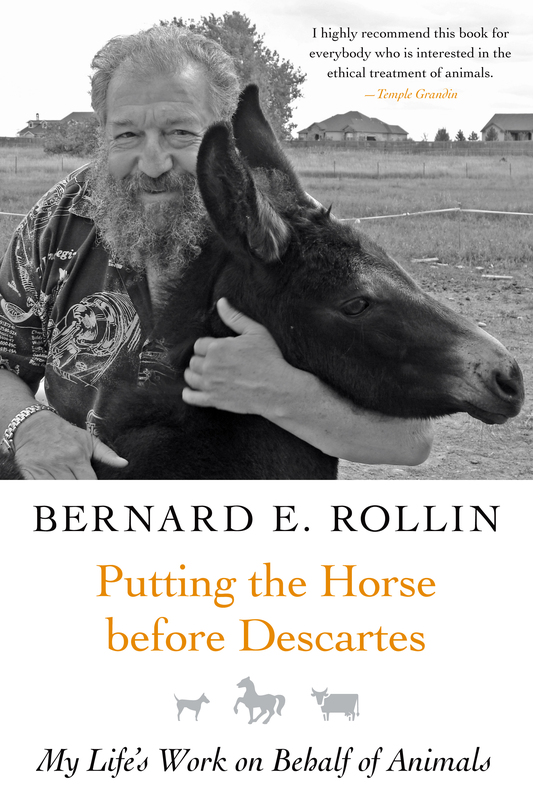 It was quite natural to me, in the course of trying to answer that question, to try and include animals in the moral arena and to augment their moral status. The more I studied biomedicine and veterinary medicine, the more I realized that both fields ignored the ethical presuppositions of their activities. Clearly a dominant question in each field was the moral status of animals. For example, I saw the fundamental question of veterinary ethics as being whether a veterinary practitioner’s primary obligation is to animal or owner. In biomedical science it was universally believed that experimentation on animals was basic to scientific progress, yet no one engaged the question of what entitles us to hurt these innocent being for our own benefit. I also noted that animals did not receive the best possible treatment consonant with their use in research – for example, there was no knowledge or use of analgesia. I resolved to bring pain control into science. Q: Your work has introduced you to biotechnology, animal and industrial agriculture. How did you become involved in all these various fields, and how did you adapt to the different issues you faced? A: I became interested in a wide variety of animal uses in society, hoping I could change things for the benefit of animals. The above uses were obvious areas where one needed to introduce ethical thinking about animal welfare. I have been remarkably blessed with wonderful colleagues in a variety of areas who guided me in mastering these areas even when they disagreed with me. My colleagues have been extraordinarily generous with time and tutelageand have kept me from making a fool of myself in new areas. I in fact have been vindicated in my activities by receiving joint appointments in the departments of Biomedical Sciences and Animal Sciences where I teach courses and do numerous guest lectures. I have even done research to benefit animal welfare under the aegis of such colleagues, who on many occasions donated their own time and research money. If there is a more open University than Colorado State University, I do not know of it. Q: What has surprised you most in your work? A: I have been most surprised by the degree to which rational argument can change people’s thinking at any educational level. In fact, MD/PhDs are far more rigid in their thinking than “ordinary people” or cowboys. On one occasion, I spoke to the Montana cattlemen’s Association. When I contracted for the speech, they asked me how much time I needed. I replied “as much if you can give me.” To my astonishment, they gave me eight hours with an hour off for lunch. In fact, they stayed for 10 hours, only reluctantly stopping because I had a dinner engagement. Q: What has been the most rewarding part of your work? A: Without a doubt, the most rewarding part of my work has been producing measurable diminution in the amount of pain and suffering animals experience, be it by virtue of laws mandating analgesia, or by virtue of my eliminating brutal and brutalizing laboratory exercises. There is probably no greater “high” than alleviating the suffering of innocents. 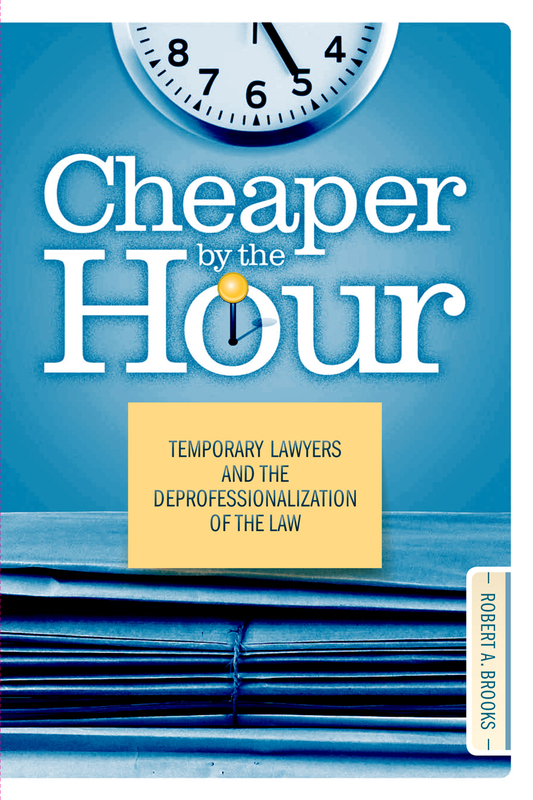 In his new book, Cheaper By the Hour, Robert A. Brooks recalls his first-hand experiences of being a temporary attorneys and the mind-numbingly repetitive task of document review. When I began working as a temporary attorney in Washington, D.C., I frankly was excited to be making $25 or $30 per hour (plus time-and-a-half for overtime), although I had no idea what I’d be doing. I had spent the previous couple of years on a university fellowship, working toward my doctorate in Sociology and surviving on the $12,500 annual stipend plus student loans to fill in the gaps. Although I didn’t want to return to a law career, I was happy that I’d found a way to finance my dissertation – do a project or two, write a chapter, do another project or two . . .
My excitement turned to surprise and eventually dismay when I discovered the kind of work we were asked to do, and where we were asked to do it. My first project was located in a rotting, condemned office building in Virginia, and the work involved something called “document review” – reading documents on a computer screen and then “coding” them by fitting them into one of several possible pre-determined categories. I worked on this large litigation project for about six months and then took some time off to do some research and writing. And just as planned, I started another document review project and then alternated temping with writing, for several years. The work (as detailed in Cheaper by the Hour) was mind-numbingly repetitive but I saw it as a necessary evil – the best-paying work I could get while giving me some flexibility to finish my dissertation. However, it’s tough for me to take a purely outcome-oriented approach to anything, even if it’s only temporary. I need to find some sort of meaning in what I do. One night while taking a taxi home from a very long day on my second project, I had an “aha” moment. I thought: “Temporary attorney work is such a weird little subculture. Someone ought to do a study on it.” I stopped myself and laughed out loud a little bit, ignoring the quizzical look in the rear view mirror from the cab driver. I said to myself (as I later wrote down): “Boy, I must be tired. I’m getting a Ph.D. in Sociology and I’ve done research and teaching in the Sociology of Work. I’m going to do a study on it.” I spent the rest of the cab ride sketching out a plan. I was happy to discover that no one had done a similar study. In fact, even in the legal press the “real world” of document review was almost never revealed. I began to take notes in earnest and to interview my fellow temporary attorneys. While the work didn’t change (it was tedious and insecure, and I didn’t feel like I was working as a lawyer), I was spurred and excited by the notion that I could someday publish a study of this strange little workplace culture I’d found. Now that I have, I’m curious about the reactions temporary attorneys as well those who hire and work with them will have to Cheaper By the Hour. I have immense respect for document review attorneys, many of whom are able to maintain their concentration and their professional work ethic while performing rote, assembly-line style work. I hope that law firms and corporations appreciate how miserable this work can be, and then take steps to ameliorate the objective and subjective qualities that make it so. Document review work – and the workers who do it – has been mostly hidden, and for too long. Let’s have some public conversations about it.